I was driving along a busy shopping street with my three-year-old daughter in the backseat when she suddenly shrieked “Stop Mum!”. I hit the brakes, not knowing what the problem was when she pointed out the window to a bridal shop and said “Look at that beautiful princess dress!” I found the whole thing both funny and odd – there hasn’t been any weddings amongst our family and friends for some time so my daughter hasn’t had any bridal exposure yet her ‘princess dress’ radar is highly receptive! 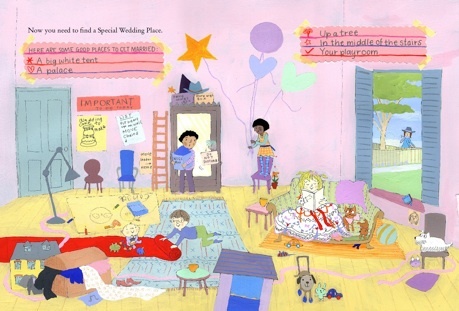 I will admit that there were nagging worries at the back of my mind when I bought How to Get Married by Me, the Bride, written by Sally Lloyd-Jones and Sue Heap. Was I buying into the whole ‘fairytale’ fantasy? Would my daughter’s main aim in life be to become a bride? There is certainly divided opinion amongst book reviewers about this picture book but my worries were quickly put aside two pages in. This very funny ‘how-to’ manual pokes fun at the bridal industry in a way that many parents will find hilarious and kids will find ‘informative’. Wedding guests should note that when the music starts “…everyone has to stop WHATEVER they’re doing and look at you” and wedding traditions are observed – “Now you throw a big bunch of flowers at people’s heads.” This book would be a particularly good gift for any bridezillas in your midst. 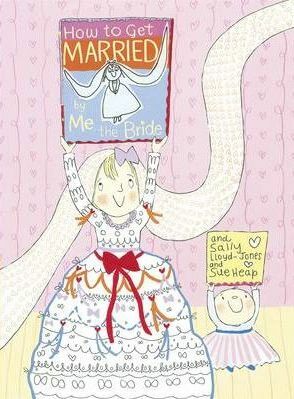 How to Get Married by Me, the Bride is available from Book Depository for $11.73. Book Depository deliver to Australia free-of-charge. Also by Sally Lloyd-Jones and Sue Heap is the equally funny How to be a Baby by Me, the Big Sister.